A large group of deciduous trees and evergreen shrubs that produce masses of showy flowers in spring. Many deciduous forms provide good autumn foliage colour. The genus includes flowering (ornamental) versions of almond, blackthorn (sloe), apricot, cherry, cherry laurel, peach, plum and Portugal laurel (cherry bay). Common Names: Flowering cherry, ornamental cherry, cherry blossom. Foliage: Oval, long pointed, green or red-purple leaves. Flowers: Prolific white or pink blossom. Single or double. Soil: Moderately fertile, moist but well-drained soil (chalk, clay, sand or loam). Acid, alkaline or neutral pH. Conditions: Full sun. Can be grown in an east, south or west facing aspect in either an exposed or sheltered location. Hardiness: Fully hardy in the UK (down to -20°C). Note: Blossom can be damaged by late frosts. Prunus will usually do well in any well cultivated soil type except for highly acidic or water-logged conditions. Plant early flowering forms in a sheltered site to protect the blooms from spring winds and late frosts. Later flowering forms make ideal specimen trees, which can be grown by themselves in the lawn or with other trees and shrubs. Most prefer an open sunny position but can usually tolerate a little light shade. Only the evergreen species will tolerate dense shade. Shrubby forms can grown as a flowering hedge or screen. However, cherry trees are not recommended for the herbaceous border due to their tendency to form suckers. Container-grown specimens are best planted in early autumn to late spring. Hedging plants should be set about 18in (45cm apart. Pruning of most forms is not necessary. However, cut back the young shoots of P. glandulosa and P. triloba to two or three buds after flowering if you want to keep these shrubby forms in check. Deciduous hedges can be trimmed after flowering. Susceptible to attack by aphids and caterpillars. Bullfinches may eat flower buds. Can be affected by a wide variety of diseases, including pocket plum, silver leaf, honey fungus, peach-leaf curl, bacterial canker and blossom wilt. Sow seed of deciduous species in the autumn. Large-flowering trees are normally propagated by grafting to a suitable rootstock. Small trees, hybrids forms and shrubs can be propagated by striking 3in (8cm) cuttings in a cold frame in July. Prunus is a very large genus of plants including varieties of almond, apricot, cherry, cherry laurel, peach, plum, and Portugal laurel. P. avium (wild cherry, sweet cherry, or gean) is a medium to large woodland tree with oval, long-pointed leaves, which turn yellow or red in autumn. Large white flowers appear in April. Height to 66ft (20m), spread 33ft (10m). P. x amygdalo-persica (almond and peach hybrid). The popular cultivar 'Pollardii' forms a small spreading tree with lanceolate long pointed leaves. Bright-pink flowers appear before the leaves in March. Height to 26ft (8m), spread to 20ft (6m). P. x blireana (ornamental plum) is a medium sized round shaped tree with bronze-red young foliage that turns almost green. Bears bright pink, double, rosette-like blossoms before the leaves in March to April. Height and spread to 15ft (5m). P. cerasifera (cherry plum) is a large round shaped tree bearing small masses of white blossoms in March and April. Plum-like, edible fruits follow later. Height to 26ft (8m), spread 33ft (10m). Popular cultivars include 'Nigra' with deep-red/purplish leaves and pink flowers, and 'Pissardii' with pink budded white blossom. P. glandulosa (ornamental almond) is a compact shrub with ovate mid-green leaves. Good autumn leaf colour. Height and spread to 5ft (1.5m). Popular cultivars include 'Alba Plena' with double white flowers and 'Rosea Plena' (syn. Sinensis) with double pink flowers. Available at Thompson & Morgan. P. x hillieri Spire is a narrow tree with upright branches. The young leaves are bronze, with good autumn colour. The pale pink flowers are freely borne in April. Height to 33ft (10m), spread 8ft (2.5m). Ideal for confined spaces. P. incisa 'Kojo-no-mai' (Fuji Cherry) is a neat, compact spring flowering shrub that is ideal for small or low-maintenance gardens. The abundant blossom is white, tinted with pink. The foliage turns fiery shades of orange and red in the autumn. Height and spread to 8ft (2.5m). Available at Gardening Express and Thompson & Morgan. P. nipponica 'Brilliant' is a small shrub/tree that ideal for small to medium gardens. The young brown leaves, turn green, then orange and red in early autumn. Pale pink (almost white) blossom appears in spring. Height to 10ft (3m), spread to 6ft (2m). Available at Thompson & Morgan. P. padus (bird cherry) is a medium-sized spreading tree with small, fragrant, white flowers, borne in dense racemes in May; followed by small, black fruits. Popular cultivars include 'Colorata' with bronze and pink flowers and 'Watereri'. Height up 33ft (10m), spread 26ft (8m). P. persica (ornamental peach) is a spring flowering tree, available in a wide range of varieties and forms. Height to 15ft (4.6m), spread to 20ft (6m). P. triloba (ornamental almond) is a shrubby form with three lobed leaves at the tip. White or pale pink flowers appear in late March to early April. Height and spread to 10ft (3m). Popular cultivars include 'Multiplex' with pink double flowers. Available at Gardening Express. P. sargentii is a small to medium-sized spreading tree with obovate, taper-pointed, red leaves that turn orange and red in early autumn. Rich pink blossom covers the tree in March and April. Height to 26ft (8m), spread to 20ft (6m). P. spinosa (blackthorn, sloe) is a dense, twiggy, spiny shrub that produces small white flowers in March to early April, usually before the leaves appear. The flowers are followed by bitter blue/black fruits called sloes. A popular garden cultivar is 'Purpurea', with purple-red leaves. Height to 13ft (4m). A liqueur, called "sloe gin", can be made by infusing gin with sloes and sugar. Available at You Garden. P. tenella (dwarf Russian almond) a compact, green leafed, shrub covered with small pink flowers in April, often followed by small velvety fruits. Popular cultivars include 'Fire Hill' with bright rose-red flowers. Height and spread to 4ft (1.2m). P. xyedoensis (Yoshino cherry) is a compact tree with arching branches and long-pointed leaves. Pink buds open to white blossom around March and April. Height to 16ft (5m), spread to 20ft (6m). The following list of deciduous hybrids originate mainly from Japan. 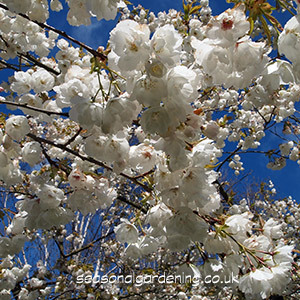 They provide spectacular spring-flowering trees but are often short lived in the UK. P. 'Amanogawa' (syn. 'Erecta') is a narrow, erect-branched tree. Pink, fragrant, semidouble flowers appear in large clusters from April to early May. Height to 20ft (6m), spread 4ft (1.2m). Available at Thompson & Morgan. P. 'Cheal's Weeping' (syn. 'Kiku-shidare Sakura') is a splendid weeping tree with bright pink double blooms in late April. Height to 8ft (2.5m), spread to 10ft (3m). P. 'Kanzan' is one of the commonest double flowering cherries grown in the UK, with an attractive vase-shaped head of ascending branches. The young leaves are bronze leading to good autumn colour of yellows and orange. Large, double, purplish pink blossom appears in late April to early May. Height and spread to 33ft (10m). Available at You Garden and Notcutts. P. 'Shimidsu Sakura' (syn. Longipes') provides and impressive flat-topped, spreading tree, with clusters of large, semi-double, pure white frilly flowers from mid-May. Height to 20ft (6m), spread to 33ft (10m). P. x 'Pink Perfection' is a British hybrid between 'Kanzan' and Shimidsu Sakura'. Pale pink and white blossom from April to May. Height and spread 26ft (8m). P. 'Shirofugen' is a fine spreading tree with deep-red young foliage and fragrant double white blossom in May . Height to 26ft (8m), spread 33ft (10m). Available at Notcutts. 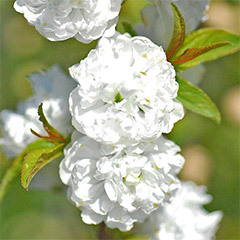 P. 'Shirotae' (Mount Fuji cherry) is a low growing, wide-spreading, tree with green leaves and fragrant semi-double or single white blossom in April, which hangs in clusters. Height to 16ft (5m), spread to 33ft (10m). 'Autumnalis' an autumn flowering cherry with semi-double pale pink flowers. 'Pendula Rosea' and 'Pendula Rubra' weeping cherries with pink flowers from March to April. P. 'Tai-Haku' (great white cherry) is a medium-sized tree with large bronze-red leaves, turning green and then yellow/orange in autumn. Large pure white flowers appear in April. Height to 26ft (8m), spread 33ft (10m). P. 'Ukon' (syn. P. serrulata 'Grandiflora') is a vigorous small tree with attractive bronze young foliage and semi-double yellowish-white flowers in late April. Red-brown autumn colour. Height to 26ft (8m), spread 33ft (10m). tree that is ideally suited for cultivation as a hedging plant. It has leathery, glossy green leaves, topped with white flowers in the spring, followed by purple-black fruits. Height to 20ft (6m), spread to 30ft (10m). Popular cultivars include 'Otto Luyken', a compact form with narrow dark green leaves (available at Gardening Express), 'Rotundifolia' with shorter leaves and a vigorous upright habit (available at Thompson & Morgan and Gardening Express), and 'Zabeliana' with narrow, willow-like leaves. P. lusitanica (Portugal laurel or cherry bay) is a large shrub or small tree with long, dark glossy-green, ovate leaves on red petioles. White fragrant flowers appear in racemes in June, followed by red, then black fruit (lime-tolerant). Height and spread up to 20ft (6m). Available at Thompson & Morgan.